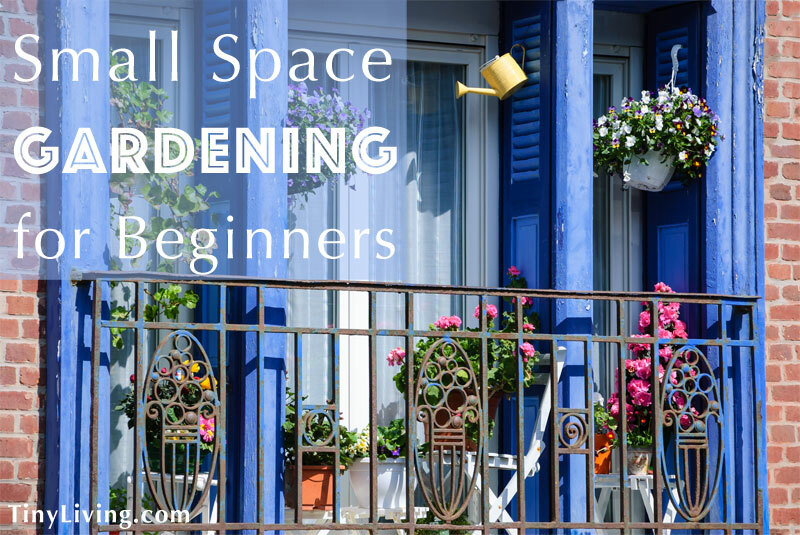 Along with increasingly urban living has come the need to translate any hobby into a smaller, more limited setting, and that includes gardening. Living in small spaces most of my life, previous attempts at gardening were limited to a few outdoor flowering plants and indoor tropicals which didn’t have the space, time, or conditions to flourish. Now that I have a balcony in the temperate Northwest and a little more time, I plan to utilize this small space to build a garden of my own. Thousands of people are learning they don’t have to give up this pleasure just because they live in a small space, and neither do you. All you’ll need to get started are containers or pots, the right choice of plants, and a touch of creativity. Choosing which containers to use for your window or balcony plants boils down to what suits your space, personal preference, and the needs of the plants you want to grow. Herb growers usually prefer long trays, flower lovers their pots. I’ve seen people use old wine boxes, sideways pallets, gutters, or mason jars. Whichever you choose, sufficient drainage is important for avoiding root rot. Terra cotta pots are the most recommended, particularly those with built-in saucers (to avoid leaking onto balconies below you!). What you plant in a small garden will depend on what you want to get out of it. Do you want a little color and privacy? Plant a good mix of perennials and annuals so something’s always in bloom, and let some ivy grow up a wall, trellis, or around the bars of your balcony railing; place taller shrubs strategically to block views. Do you want a fragrant getaway, or a butterfly haven? Choose strongly-scented plants like lavender, geraniums, honeysuckle, gardenias, or mint for an aromatherapy experience; butterflies and bees prefer plants like asters, borage, oregano, sunflowers, salvia, lavender, coneflowers, yarrow, and Gloriosa daisies. Do you want grow your own food? Choose any herb or vegetable you can give enough space, especially: basil, parsley, leaf lettuces, tomatoes, peppers and chilis, eggplant, peas, cauliflower, cabbage, potatoes, cucumbers, green beans, certain varieties of sweet corn, green onions, radishes, turnips, zucchini, peanuts (surprise), and fruit like blueberries, strawberries, grapes, figs, and currants. As with any garden, follow natural growing seasons for the best results and learn what grows well in your climate. Moisture is vital when container gardening, especially if your plants are on a balcony. You’ll need to water them every day, or twice a day during dry seasons. For extra TLC, feed them with a natural fertilizer or compost every few weeks. Where you choose to place your plants depends on space and creativity. Do you only have one windowsill? Make the most of it with small pots or a window tray. You can grow the same kinds of plants in a window as on a balcony, but choose according to sunlight needs. The best vantage is a west-facing window, and if it gets less than 8 hours of direct sunlight, opt for herbs and leaf crop plants. These also have faster growing cycles, allowing for continual harvests to keep the plants under control. Balconies are extremely versatile for growing many kinds of plants. Place sun-lovers in areas that get more sunlight, and shade-lovers in the shadow of eaves or overhangs. As for staging, the sky is literally the limit! One word of caution if you plan to go all-out: check the weight limit of your balcony, as the weight of pots and soil can add up quickly. Go vertical. Is your balcony short on floor space? Put up a trellis, pegboard, a tiered rack, grab zip-ties or brackets, and go up instead of out. You can easily tie small pots or mason jars to posts and poles, or if you’re allowed, mount a tray to a sidewall. The most creative vertical idea I saw was a re-purposed canvas shoe hanger used to grow herbs. Repurpose furniture. If you have old bookshelves, bar carts, ladder shelves, patio furniture, or other furniture you don’t mind being exposed to the elements, they’ll add unique flair to your balcony décor while increasing usable space. Create an illusion. A rectangular space for gardening seems boring, but by alternating plants of different heights and adding ‘depth’ to your garden, you’ll create the illusion of a living, encompassing oasis. Small spaces don’t dictate small gardening. Build a creative container garden that yields bountiful food for your table and soul! Love the article. If you are ever back in Michigan ,we have room for you both.